If you’ve seen Total Recall, you’ll know it’s probably not a good idea to tamper with your memory, as exes Joel Barish (Jim Carrey) and Clementine Kruczynski (Kate Winslet) discover when they rashly decide to purge themselves of all traces of their relationship. The film is set in New York, where Joel supposedly lives in ‘Rockville Centre’ on Long Island, but the rail station at which he makes the apparently spontaneous decision to visit the coastal town of Montauk on a chilly Valentine’s Day, is Mount Vernon East Station, 1 East First Street, Mount Vernon, about 14 miles (30 minutes or so by rail) from Grand Central Terminal in Upstate New York. And around 80 miles from Montauk, which stands on the far eastern tip of Long Island. It’s on the wintery beach at Montauk that Joel first seems to glimpse the impulsive, blue-haired Clementine, and in the Plaza Restaurant, 752 Montauk Highway, that he wonders why he falls in love so easily. The beach house, which is destined to recur throughout the film, is actually in Wainscott, some 30 minutes on the train from Montauk. It’s at the end of Georgica Association Road and, though this is a private road, it’s possible to see the house from the beach (as ever, please remember that this is a private home and please don’t do anything to disturb residents). On the train back into the city, the pair strike up a conversation and, after Joel offers Clementine a lift, she invites him in for drinks to her house at 59 Orient Avenue, by Cooper Park in East Williamsburg, Brooklyn. They hit it off and spend the next evening lying on the ice of the frozen ‘Charles River’. Actually, they’re in Franklin D Roosevelt State Park, 2957 Crompond Road, up in Yorktown Heights, about 40 miles from New York City. 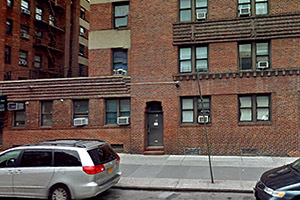 The film’s timescale seems to fracture as Joel drives along Riverdale Avenue, just south of Yonkers, to his apartment in the Edendale Apartments, 123 Valentine Lane, in Yonkers itself. And when he visits Clementine in the bookstore where she works, he’s disturbed to find she doesn’t recognise him. Supposedly the ‘Long Island’ branch of ‘Barnes and Noble’, this is the bookshop of Columbia University bookshop, located at Broadway and West 115th Street in Morningside Heights, New York. At the home of his friends Rob and Carrie, 46 Mount Pleasant Road, in Yonkers, Joel is shocked to learn that Clementine has hired a mysterious company called Lacuna to erase him from her memory. Visiting Dr. Mierzwiak (Tom Wilkinson), who runs Lacuna Inc from its office at 504 Grand Street at Columbia Street on the Lower East Side, Joel in turn opts to have Clementine wiped from his consciousness. Two worryingly easygoing techies, Stan (Mark Ruffalo) and Patrick (Elijah Wood), are duly dispatched to Joel’s Yonkers apartment to begin the process of draining away his unwanted memories. But as Clementine begins to be deleted, Joel desperately chases after her in the benighted streets of his unconscious mind. ‘Saratoga Market’, the convenience store whose very name evaporates as Stan and Patrick get to work, is Superior Market, 208 Saratoga Avenue at Caryl Avenue, in Yonkers. The process continues relentlessly, reaching back to a discussion between Joel and Clementine about the possibility of having a baby. More and more details fade as the pair stroll through the flea market on the east side of Orchard Street, just south of Rivington Street in Little Italy. Over in the Gramercy Park district, ‘Kang’s’, the Chinese restaurant in which we witness their relationship deteriorating over a fraught meal, was Tien Fu Guong, 180 Third Avenue at East 17th Street. Joel begins to regret the apparently unstoppable erasure, even as fellow travellers begin to disappear from the concourse of Grand Central Station, and his mind frantically scrabbles around to discover some remote, unmapped corner in which to store the remaining memory of Clementine. Retreating into deeply buried recollections of his youth, he attempts to secrete her in his childhood home – 105 East 23rd Street, in Bayonne, New Jersey – not far from locations seen in Steven Spielberg’s War Of The Worlds (the studio facility used was the Peninsula at Bayonne Harbor, formerly the Military Ocean Terminal, a military base). As Lacuna employee Mary (Kirsten Dunst) recites the Alexander Pope poem which provides the film’s title, Joel and Clementine in happier times watch the arrival of the elephants at West 34th Street and 7th Avenue for the Ringling Bros’ Circus.